The aim of this linguistic analysis is to substantiate relationships between distant language families. Hereby, the author intends to contribute to findings regarding the early settlement of Earth and the history of mankind. However, he finds current methods of historical-comparative linguistics not fit to prove relationships reaching this far back in time. To still be able to connect such diverse languages and thereby providing information about the history and pre-history of language, the author presents here a novel method to the established modes of operation of historical-comparative linguistics. By this approach, the author intends to make semantic-phonological equivalents between languages and language families as evidence for further relationship between these language groups. 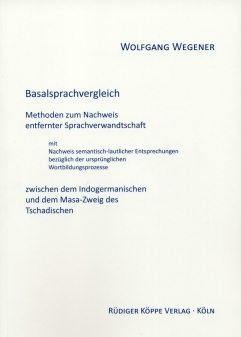 Since this method compared the very basis of the languages under description, that is, in a scope even more narrow than traditional applied linguistics, it is more adequate here to speak of a basal-comparative approach. To substantiate his method, the author goes on to present a concrete example of how it works. To prove a close relation between Indo-European and the Masa subgroup of the Chadic languages of Africa, he applies his own criteria and parameters to compare particular ancient word stems and compositions of these languages, only to ultimately arrive at some unexpected conclusions.